As late and annoying as this can be the battle continues. Christian Louboutin a design of extravagant woman's shoes for many years has place a suit against YSL use of the red sole. YSL has outstandingly used a colored sole for a number of years to portray a chic and inviting look to a heel. 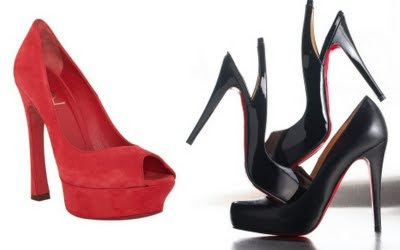 Due to the growing popularity and demand for a Christian Louboutin red soled heel; Christian Louboutin believes he should be able to trademark "a color in the fashion industry. "( If that is not a joke.) The court has denied Christian Louboutin's appeal but he is at it again and will be back in court this today Friday August 19, 2011.